Headaches can quickly hinder your enjoyment of daily life. When you suffer from a penetrating pain in your head, normal functioning is simply too difficult. Migraine headaches may also be the cause of sensitivity to light and sound, nausea and vomiting. People struggling with migraines may be immobilized for days on end, lying in a dark room to escape the pain. 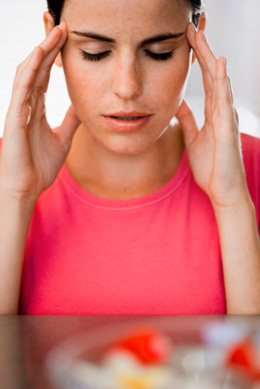 Everyone, even healthy individuals, can suffer from headache or migraine pain. Fraum Chiropractic Life Center offers natural healing solutions to help individuals overcome this pain without relying on drugs. To help, we offer options for natural headache relief. Chronic headaches and even migraines may be caused by a mechanical misalignment of the spine. When the nerves in the spine are hindered from functioning as they should, you might suffer from a headache. Without treatment, that headache can turn into a migraine. Fraum Chiropractic Life Center offers natural treatments for headaches, migraines and neck pain for patients in Hilton Head Island. Our chiropractic team uses natural, proven treatments to provide relief from your pain. Chiropractic adjustments have been proven to be an effective treatment for reducing migraine headaches and reduce neck pain. Adjusting the cervical spine can reduce the pressure on pressure points that contribute to headaches. Without this pressure, blood can flow more freely to the brain, lessening the risk for a headache. Over time, chiropractic treatment can reduce the frequency and intensity of chronic headaches. While misalignment in the neck is a common cause, the truth is that we are still learning all of the potential causes of this complex problem. Sometimes environmental triggers, lack of sleep, hormonal changes and even dehydration can cause headaches. Some people suffer from headaches when changes in barometric pressure occur, and stress can definitely be a contributing factor. Foods can also be a trigger, and processed foods are often a contributing factor in people who suffer from chronic migraines. At Fraum Chiropractic Life Center, our headache treatment begins with ensuring the spine is in proper alignment. We will then help you explore and identify potential triggers. From there, our team will work with you to determine how you can avoid those triggers as you work towards improving your overall health. Sometimes, migraines and headaches have a complex set of causes. To assist with addressing all of these causes, our chiropractors will also help you take steps to reduce stress, get sufficient sleep and keep your body in good health through nutrition and supplement suggestions. The end result is a body that is better able to deal with occasional triggers and avoid a headache. If you are suffering from headaches or migraines, our drug-free, whole body approach may be the answer you are looking for.